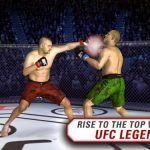 360 Studios recently released an update to their MMA game for Android and iOS called MMA Federation, so we’ve thought it’s time to cover this exciting game in detail here on Level Winner. First of all, since this game isn’t a licensed UFC product, don’t expect to see Conor McGregor or Ronda Rousey. However, if you want an alternative to the likes of EA Sports UFC (a game we’ve covered several times in the past), this might be what you’re looking for. It really is an alternative, as fighting here is turn-based, instead of live. And there’s arguably more flexibility here. You can create your own fighter, choose his appearance and fighting styles, and fight in career mode, which features a mix of fictional fighters, as well as some real-life non-UFC mixed martial artists like King Mo and Bas Rutten. You’ll also have the option to fight other human players in real time or offline, or add friends and fight them as you compete for gold, for cash, and for glory. And through it all, you’ll have more than enough chances to train your fighters in their disciplines of choice, or maybe in new ones. It can be a big transition from conventional MMA/wrestling games like EA Sports UFC and WWE 2K to a turn-based title like this one, but this MMA Federation ultimate guide could help you through the transition, whether you’ve just started playing or if you’ve been fighting for a while but not getting places. There are several disciplines or fighting styles you can choose from in this game, and you can choose them for your fighter once he’s done with the tutorial fights. Each discipline has their own strengths and weaknesses, and it’s all up to you – what kind of fighter do you want to have for starters? Do you want someone who throws powerful strikes in stand-up, or do you want someone with a strong ground game? Or maybe you want a balanced fighter who truly epitomizes the term mixed martial arts? If you’re looking for a good stand-up fighter, then you definitely want to choose Muay Thai, Kickboxing and/or Boxing. Muay Thai has a plethora of low kicks, knees, and good defensive moves, while Boxing is great if you want high-impact stand-up moves that don’t eat much into your stamina. Kickboxing focuses on kicks, naturally, and a lot of the kicks here can do a lot of damage. Wrestling is your discipline of choice when it comes to takedowns and defense, while Jiu-Jitsu, is mainly based on submissions – choose this if you’re looking for someone who can make the other guy tap out. There are also weaknesses to speak of for each discipline. In Boxing, you don’t have any leg moves to speak of. Muay Thai’s basic moves don’t do a lot of damage. Kickboxing expends a lot of stamina. Wrestling has a clear lack of strikes and submissions. Lastly, your stand-up moves in Jiu-Jitsu will always be very limited. If there is a best strategy for choosing your disciplines in MMA Federation, it’s to choose styles that complement each other. For example, you can choose Boxing for its strong stand-up game and low stamina, and complement it with Jiu-jitsu, so you can make use of takedowns and submissions. Or you can opt for Kickboxing for those powerful kicks, but complement it with a low-stamina discipline such as Boxing. You can’t expect to go far and level up if you don’t train to become better. Each discipline has different mini-games which you can play in Training mode – they may be fights against a trainer (often a real-life fighter) or punching bag mini-games, to name a few. And as you complete more of these mini-games, you’ll earn a higher-level belt, earn coins, cash, and experience, and even unlock more than a few new moves. These new moves are important, as you will need these higher-impact moves as you begin to face steeper challenges in Career Mode. Furthermore, once you reach Orange Belt in all unlocked levels, you can unlock the other disciplines you didn’t choose when originally asked to do so. Unfortunately, we strongly advise you against buying customizations at the store. Your coins (the main currency) and cash (the premium currency) can be used in much more practical ways, so don’t be tempted by cool-looking rashguards, gloves, tights, shoes, or the like that simply look good on your fighter but don’t do anything else in terms of actual fighting. Based on our experience, they only make your fighter look different, and nothing more. In MMA Federation, you have the option to fight other players from all over the world, so go ahead and take advantage of it! You can fight random opponents, and if no one is available online at the moment, you have the option of fighting another player who’s currently offline, with the computer AI taking over for that player. And we strongly advise you to add some friends – some Trials (see below) will require you to win so many Fight a Friend matches, so go ahead and add those friends if you want more cash, coins, and XP. If you’re in need of coins or cash, or if you need to level up in order to progress to the next set of training mini-games, you know what to do – grind it out. If you’ve one-starred or two-starred a fight in the past, you can always go back to it with more health and stamina points and accomplish more objectives. For example, if you won a fight with just one unit of health remaining and consequently got one star, you can go back once you’ve got more starting health points, and accomplish the goal of winning with 15 Health remaining. The same applies for the training mini-games; if you didn’t get three stars on your first try, you can go back, take stock of what you didn’t do right the first time around, and apply that knowledge in hopes of earning three stars and earning more and better rewards. Trials are this game’s equivalent of quests or missions – these are achievements which you can accomplish in-game, and you can be rewarded with cash or coins for successfully completing a Trial. And if certain Trials don’t appeal to you, the game will allow you to re-roll once for another random Trial, though this privilege can only be used once a day. Now, let’s get down to what you probably have been waiting for – fighting tips. First, let’s start with the basics – what’s in it for you before you start a turn? Each round has eight turns, and you will either be asked to hit an attacking or a defensive move on your opponent. You want to look at your opponent’s statistics before choosing moves. Check how much stamina he has left, as well as the stamina cost of his available moves. And also look at the moves themselves; are the offensive moves targeted at your head, your body, or your legs? Are there any takedowns to drop you, or submissions, should you already be on the ground? Take all of these things into account before choosing a move, and hold down on a move for more information on what it can potentially do. When it’s your turn, you should also be monitoring your available stamina. Whenever possible, go for as many moves as possible as you can afford with your stamina, and if you can afford to save some stamina by opting for just one move, then do it. Sometimes it’s a good idea to save up on stamina so that once your stamina bar (the blue one below your health) is full, you can unleash a flurry of attacking or defensive moves on your opponent, potentially turning the tide in a match. Unfortunately, MMA Federation’s fighting mechanics don’t offer you the luxury of time. You only have so many seconds to choose a move, and once the timer expires – you’ll be notified in the bottom part of the screen once you’ve got 10 seconds or less remaining – whatever moves you selected will be executed, whether you like it or not! Some attacking moves will allow you to pull off a Critical Hit, which effectively allows you to double the damage should you hit it the first time, or still be able to do damage even if your opponent had cleanly blocked it. When choosing between ordinary moves and crit hit moves, always go for the latter as long as it doesn’t cost you a good deal more stamina than the ordinary move. On the other side of the fence, there are some defensive moves that will allow you a chance to counter an opponent’s attacking move. Should you go for them? We say not always – it depends on what’s on deck for your opponent in terms of his attacking moves. Launching a defensive move with a counter is always a big gamble – if you’re able to hit the counter-attack, you’re “stealing” damage and giving you some nice momentum on your next turn, which will have you on the attack. But if you fail to hit the counter, you leave yourself vulnerable to more damage, and that could lead to some unpleasant consequences – sometimes, it’s like snatching defeat from the jaws of victory, to reverse the old adage. Want to earn more coins and cash without having to fight? Go to the Store and once again, don’t be tempted by those spiffy-looking clothing items, gear, hairdos, and beards. What you want to do is to tap on the Free Coins or Free Cash buttons. Hit the Free Coins button and you’ll earn coins simply by watching a video. Hit the Free Cash button and you’ll be given a list of special offers; normally, you’ll be asked to install a new game or app, and even if you don’t need that game or app, go ahead and download it and install it on your device. You can always delete the game or app anyway once you’ve redeemed your free cash. The time lapse cheat, for the meantime, seems to work on MMA Federation, though we wouldn’t recommend doing it as this game requires you to be online in order for your progress to be saved. Simply advance the time on your phone or tablet by about two hours if you’re all out of energy, then return to the game with your energy refilled, allowing you to keep on fighting or training. Again, exercise discretion when doing the time lapse, as this could be a bit risky. 15. What Can You Do With All That Cash? We would suggest spending your cash on buying a new fighter. If you’re new to the game or simply want to try out all the possible disciplines, it’s a good idea to spend 700 in cash to unlock a new slot for a fighter. Just make sure that his disciplines are different from the ones your base fighter is using, if your goal is to experiment. You can also use cash to buy energy, which is what you might have to do anyway if or when 360 Studios decides to nerf the time lapse cheat, or if the company has been cracking down on time lapse cheaters all along. And this completes our exclusive guide for 360 Studios’ fantastic new game, MMA Federation. In case we come up with additional hints later on, then we will update this guide, so stay tuned!